This little Jeep is extraordinarily clean. Until last year it was registered and driven on the road. 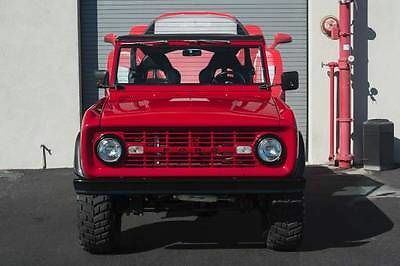 I would not hesitate to turn the key and drive this baby to California. Everything works - all gauges, blackout lights, siren, gas gauge. The rear bed of the jeep is not dented, it's extremely clean. There's a few add-ons, but nothing that can't be removed for historical purpose. The winch was used by my Dad to load on a trailer. Wired inside for push button use, also a remote control. Heavy duty LED fog lights on front and rear. Also has a CB radio and antenna, has a draw bar on front, new canvas seats, windshield wipers. Dual jerry cans on back are original, date stamped 1945, same as jeep. Tool indents on driver side. 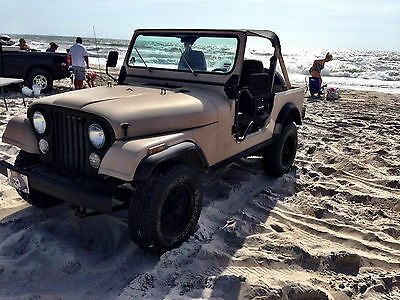 Jeep has a roll bar and bikini top. Heavy duty rubberized floor mats for driver, passenger, and cargo area, insulated underneath with jute pads. The little motor is clean as can be, runs better than a Toyota truck. No transmission issues, no transfer case issues. It has lock out hubs. It's a classy little jeep, a real head-turner, not a fixer-upper. 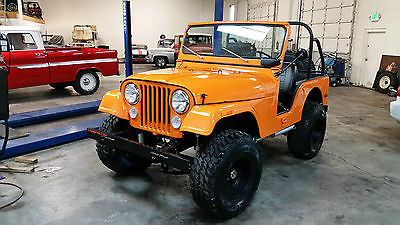 For sale is my beautiful early 1971 Jeep cj5. This jeep has just gone through a frame off restoration in my restoration shop. 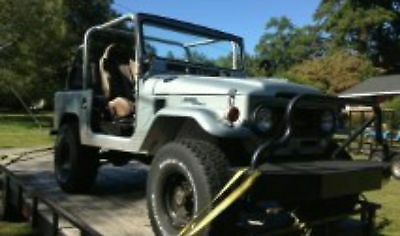 We started with a clean Arizona rust free jeep that the previous owner had started rebuilding. Previous owner had installed the strong dauntless 225 buick odd fire v6, manual transmission and dana 20 transfercase. The front and rear axles were geared to 3.73 to allow highway speeds with ease. I have driven this jeep with out any issue at 70 mph. The engine has a 4 bbl quadrajet carburetor and full length headers with side exhaust. The side exhaust is under the rocker face by several inches making it nearly impossible to burn your leg. The previous owner had also fully boxed in the frame, Installed power steering and installed a cable clutch linkage to improve clutch feel. Once we got the Jeep into my shop we stripped it down to the bare chassis. We installed the current carburetor, brand new drive shaft changed every fluid in the jeep and re sealed the differential covers. We went through the brakes checking all of the hardware, shoes and drums flushed all of the fluid and replaced anything needed. the front brakes have been upgraded to the newer open knuckle axle with larger brakes. The entire chassis was then stripped and painted with a heavy duty coating normally reserved for over the road trucks. This coating is black with a nice semi gloss finish and is hard as nails and impervious to chemicals or road salts. We then dis assembled the entire body and sanded it down. The body had no rust so no rust repair was needed. After sanding the jeep down to remove any old paint and fillers we coated the entire body and all parts with southern polyurethanes epoxy sealer. This seals the body from any future rust. We then did any body work and blocked the jeep to perfection, A second epoxy sealer coat was used before spraying the base coat clear orange. The paint has incredible depth and shine and was color sanded and buffed to the finish you see. We wanted to insulate and protect the tub so we turned to bed liner vets to spray a beautiful thick coat of bed liner on the bottom side of the tub, inside the front and rear fender wells and also the entire interior of the tub. Not only does this look great and protect the tub from rust but it also makes the entire jeep feel tight and rattle free like a new jeep! The front and rear seats were replaced with brand new Smittybilt low backs and the rear seat is a fold and tumble that matches. It folds up tight against the back of the front seats for hauling cargo. the dash has an all new set of electronic programmable gauges including speedometer, tach, coolant temp, oil pressure, voltage and fuel. All new electronic sending units for the gauges were installed. Every rubber part on the jeep has been replaced from the body mounts to the fuel filler to the windshield rubber! The windshield is also brand new with a licensed jeep logo in the corner! Every lens and chrome bezel on the exterior of the jeep are new! The old wiring harness was ditched for a brand new jeep specific harness with modern insulated wiring and a blade style fuse box instead of the old glass fuses. A sony explode stereo has been installed with 2 new speakers under the dash. It sounds great and has a plug in on the front for an mp3 or usb. All of the vintage jeep touches were retained from the swing away tire carrier, the fold down side steps to the smittybilt roll bar! Wheels are also vintage 15x10 slotted mags painted black. Tires are brand new 33x12.5x15 mud terrains and all 5 tires and wheels match. A brand new steering wheel and brand new bikini top wrap up this amazing little jeep. THe engine was treated to a full tune up, an electronic distributor conversion and a massive aluminum racing radiator with an electric fan. The fan is on an automatic temperature switch that cycles it as needed. Included in the sale is a tow bar from the original owner and a brand new in the box set of bestop black soft half doors that are not installed. I decided to allow he new owner to choose if they want them or not. 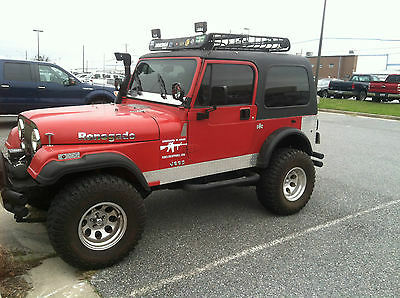 Everything on this jeep works and looks beautiful. It starts nicely even when cold and runs, drives and shifts great. Everywhere I took it when testing I got thumbs ups, compliments and pictures taken. You will not find a nicer little jeep. Truly no nut or bolt has been left unturned. 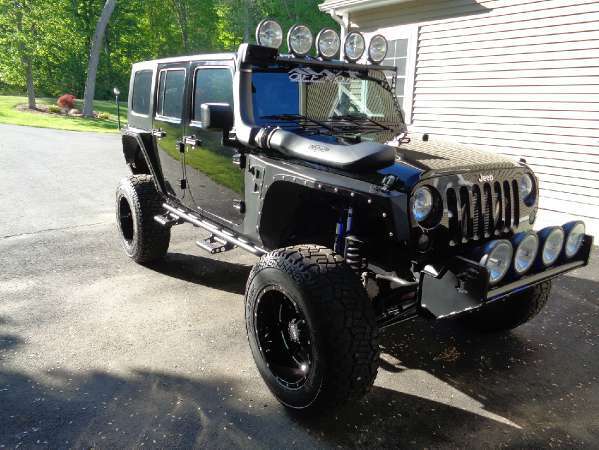 Please feel free to come and see the jeep in person as the pictures truly do not do it justice. Also please feel free to ask any questions you may have. 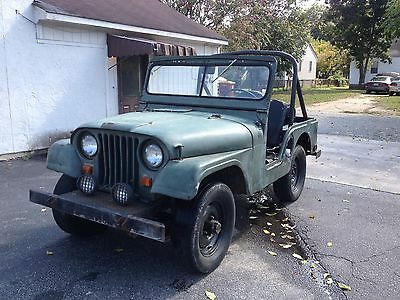 Because this is an early cj5 the vin number will not work through car fax but you can check the vin number here http://www.cj-jeep.com/cj5-6/cj5-6mainbasepage.htm It is an original v6 jeep not a swapped in job. 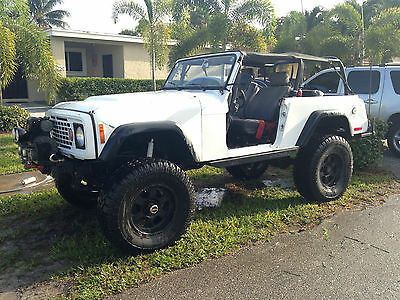 1984 Jeep CJ 7. Frame off restoration completed in May and new frame was used to ensure no rust. All rust cut out of body as you can see from the pictures and underneath. Drive anywhere anytime. New Stereo as well. Will consider all trades, please send all photos to sjonz at bellsouth dot net. Requires a deposit of $250 to purchase. If you dont like the jeep when you get here you can have back the money less fees. Can work with you to ship it if you like. Its awesome, if you have been wanting a CJ you will be pleased. More Auctions Ending Soon Don't miss out...bidadoo has auctions ending every week in two eBay stores. Construction Equipment & Fleet Vehicles Industrial, Tools & Equipment Jeep Wrangler Sport Utility 2-DR 4-Cyl. 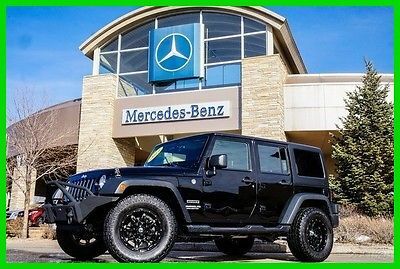 2.5L 4X4 Manual Transmission W/ Soft Top SKU: 641885 A: 0015000000tXshJ O: 0065000000RjJyX PA: View Photo Gallery Request Freight Estimate Location: Kent, WA 98032 Item Description This is a no reserve auction for a 1995 Jeep Wrangler Sport Utility 2-DR 4-Cyl. 2.5L 4X4 Manual Transmission W/ Soft Top in average operating condition. This item is being offered by bidadoo auctions - the largest and most trusted online equipment auction service. We have two great eBay stores to better serve you. View ourconstruction and transportation equipment auctions for construction machinery, fleet vehicles and heavy equipment. View ourindustrial, tools and equipment auctions for industrial equipment and tooling, general rental tools, and small equipment. Bid with confidence 100% buyer satisfaction guaranteed and inspections always available. Low-cost shipping, containerizing and port-access available for US and International shipping - for estimates click the Freight Quote Box below. 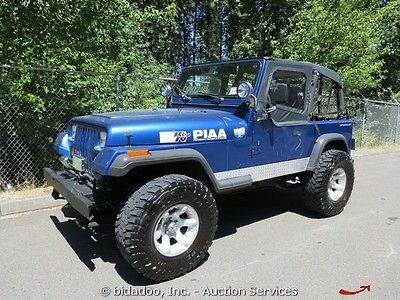 Overview: Make: Jeep Model: Wrangler Year: 1995 Mileage: 157,788 Vehicle Title: Clear VIN: 1J4FY19P6SP257080 Exterior Color: Blue Interior Color: Grey Engine Size: 2.5L Fuel Type: Gasoline Transmission Type: Manual Scale Weight: 2,943 lbs Transport Dimensions: L 150" x W 74" x H 78" Features: AM/FM/CD Radio (2) Soft Tops 33X12.50R15 Toyo Open Country Four Wheel Drive Cobra Sound Tracker K&N Air Filter Spare Soft Top Specifications: Engine Make: Jeep Type: 4-Cyl. 2.5L Fuel: Gasoline Transmission Type: Manual Speeds: 5 Wheelbase: 93.40 Drive: 4X4 Inspection Report: Overview Comments Overall Operating Condition Average - see video Overall Appearance Average - see photos/video Engine Starter Functional Exhaust System Operational Cooling System No leaks noted Fuel System Functional Oil Leaks Some minor residue normal for age - see photos Fan / Belts Average Comments Engine starts and runs well see video Powertrain Transmission Average/Fair - see video Comments Transmission shifts through all gears - clutch has a high release Chassis Body Fair/Average - dents and dings around - note damage to bed as seen in photos - tears to tailgate - holes from previous use - see photos Paint Average - some fading and chips and scratches as seen in photos Top Very Good Frame Average Suspension Average/Fair - note rear spring housing damage as seen in photos Service Brakes Functional - brakes are soft Park Brake Operational - need adjustment Comments Chassis is in average/fair condition see photos Wheels/Tires Make / Model / Size Toyo Open Country 33X12.50R15 Tire Condition Good Tread Depth FL10/32" FR 11/32" RR 12/32" RL 12/32" Interior / Cab Horn Na Seats Poor - heavy rips and tears to both seats Steering Average - see video Windows / Windshield Average - large crack to windshield Seat Belt Functional Gauges Operational Radio Functional - CD player is untested Blower Motor / Fan Functional - defrost and floor only A/C Na Engine Warning lights All return to normal Odometer 157,788 miles showing on odometer (Please read the Vehicle Registrations, Titles and Disclaimerssection below this report) Comments Interior has large holes, some pieces maybe missing as seen in photos Exterior Lights Functional Mirrors Good - no cracks Like this equipment? Share it... Tweet Please Note: Inspections and condition report limited to sound, sight, feel, and limited operational running/testing. In addition, all conditions are cross-referenced with service personnel, operators, and maintenance system records (when available). bidadoo, Inc. makes no guarantees to actual hours, miles and/or operational condition. Photos and video take priority if there are discrepancies within this listing. Weights, dimensions, features, specifications and resource links are provided for informational purposes only, are approximate, and may vary from year to year, model to model and machine to machine. Payment, Shipping and Fees: Buyers will be assessed a $96.20 documentation, administrative and handling fee for the local pickup of item(s) as shown above. Please see the Shipping tab (below) for more details including the location of the item. We accept Paypal for items selling up to $1,500, for more details please see the Payment tab (below). Vehicle Registrations, Titles, Deposits and Disclaimers: This vehicle may be subject to a $500 non refundable deposit within 24 hours of the end of the auction. Collection of applicable taxes, license, title, tonnage, trip permits and vehicle registration fees for any titled items will be in accordance with the laws of the state where the item is located, and be paid by the purchaser. Out of state purchasers of licensed items will be provided the necessary documentation needed for transfer of ownership where they reside, where they may pay taxes and registration and title fees in their state of residence. These fees, if applicable, may be added to the purchase. Please call or use ask seller a question if you would like additional information or estimates. Some vehicles may require up to 45 days for original title. A $96.20 minimum Documentation Fee to be added to this auction. This item will not be sold with a license plate. It is the buyers responsibility to provide trip permits and all paperwork necessary to legally transport this item on public roadways. bidadoo can help facilitate the necessary paperwork on request. Any license plate that may be visible in photos will be removed prior to sale. By federal law, vehicles more than 10 years old are exempt from odometer disclosure. In some cases the mileage shown on the odometer may be underreported if the mechanical limits of the device are exceeded. bidadoo expressly disclaims the accuracy of odometer readings. Such information may not be used or relied upon for bidding purposes or for any other reason. All vehicles are sold as is - where is. Never Miss Out On Our eBay Auctions – Follow Us On... About Us Shipping & Fees Payment Sales Tax 100% Guarantee Legal bidadoo is the largest and most trusted online auction service bidadoo offers: bidadoo 100% Guarantee - We guarantee what you see and hear is what you get. Quality equipment every week from reputable companies and government agencies. Convenience - Our inspections save you valuable time. Equipment Financing - pre or post auction approvals. Get Approved to bid now. For questions call Bob at Pinnacle Finance at: 1-800-566-1993. Visible trust that comes with conducting over 50,000 transparent auctions to satisfied buyers around the world. Complete and detailed equipment inspections with streaming audio and video. In-person previews and testing of equipment. Full shipping and logistics - We've shipped equipment to 64 countries around the world. Over 30% of all sales ship globally. Real-time customer service via phone (1-877-bidadoo) and Skype About Us Shipping & Fees Payment Sales Tax 100% Guarantee Legal This item will ship via flatbed truck Click here for a shipping estimate This item is located in Kent, WA 98032 Preview of this item is available 8:30am to 4:00pm Monday to Friday Click "Ask Seller A Question" link above to schedule a preview of this item or ask questions Preview and pickup location: 1001 3rd Ave S Kent, WA 98032 Please submit a request for a shipping estimate prior to your bid using the links in the auction Buyers will be assessed a $96.20 documentation, administrative and handling fee for the local pickup of item(s) as shown above Pickup and loading assistance is available 8:30am to 4:00pm Monday to Friday If required, a packaging and handling fee may be applied for any buyers that arrange 3rd party shipping About Us Shipping & Fees Payment Sales Tax 100% Guarantee Legal Unless otherwise stated above,full payment is due within four (4) calendar days after the close of auction. Unpaid auctions will be forfeited and a Non-Paying Bidder alert will be filed with eBay. As a consignment seller, we cannot make exceptions. All payments must be processed through our Buyers' Services Center in Kent, Washington. For Winning bids of $10,000 and higher we accept: Bank ACH Transfers Bank Wire Transfers Payments via www.escrow.com (an eBay Partner) For Winning bids under $10,000 we accept: Bank ACH Transfers Bank Wire Transfers Bank/Cashier's Checks For Winning bids under $1,500 we accept: Bank ACH Transfers Bank Wire Transfers Bank/Cashier's Checks PayPal Credit Cards (via PayPal) We do not accept cash in any amount All items must be shipped, picked up, or removed within 14 days of the end of auction (unless pre-approved via email). Items left after this time will be subject to a $20 per day storage fee. The buyer will forfeit the item -- and any payments made -- when storage fees reach either the sale price of the item or a time period of 30 days from the sale of the item, whichever comes first. No money will be returned for forfeited items. Without notice, items are subject to relisting immediately upon forfeiture. For items that have incurred storage fees, electronic payment of the fees due will be required for the item to be shipped or released for pickup. If you have reason for a delayed pickup, please contact us in advance to get an estimate of the total additional cost. About Us Shipping & Fees Payment Sales Tax 100% Guarantee Legal bidadoo Auctions is required to collect sales tax for the following states: Arizona California Oklahoma Pennsylvania Texas Washington Additional information: Beginning July 1st, 2008, businesses operating in Washington State who ship or deliver taxable goods within the state will need to start paying destination based sales tax(this does not include wholesale sales). What does this mean for you as an online buyer? For items that originate in Washington State -- sales tax Will Not Be Charged for purchases: That are shipped ANYWHERE outside of Washington State using a Commercial 3rd Party transportation company. By Canadian Buyers (except British Columbia) that pickup items in person or have them shipped. Note: British Columbia buyers are not charged Washington State Sales Tax if item(s) are shipped using Commercial 3rd Party Shipping transport that leaves Washington State. By residents of Oregon, Alaska, Colorado, Montana, Delaware, New Hampshire and Washington Tax Exempt Buyers (see below). Valid ID required. Washington State sales tax Will Be Charged for all other buyers that pickup items in person in Washington State or provide non-commercial shipping or transportation of their item(s). Washington Tax Rates forWashington Residentswill be based on if items arePicked Up or Delivered within Washington: Items Picked Up at bidadoo in Seattle will be charged 9.5% (For Titled Vehicles the rate is 9.8%). If items are delivered outside of Seattle by a Commercial 3rd Party transportation company, then the Washington Sales Tax rate of the Destination will be charged. Washington State Tax Exempt Buyers must fax a Washington State Resale Certificate to: 206-442-9020 (please include the eBay Item Number). More information can be found at the Department of Revenue. California Residents - Per Publication 61 "Sales & Use Tax Law," bidadoo is required to collect on purchases by consumers of tangible personal property that will be used, consumed, given away or stored in the State of California. California resellers must submit a California Resale Certificate to have taxes removed from their invoice. About Us Shipping & Fees Payment Sales Tax 100% Guarantee Legal bidadoo Buyer Protection and the bidadoo 100% Guarantee bidadoo 100% Guarantee At bidadoo, your complete customer satisfaction is our goal, and we make every effort to present detailed, accurate reports about each item we sell. The photographs and any video shown are of the actual item taken at the time of inspection (unless otherwise noted). We take pride in the products and services we provide. bidadoo is the largest and most trusted truck and equipment seller on the world's largest online marketplace. With bidadoo, you can bid with confidence. If you have any questions, please email bidadoo by clicking the " Ask a question" link (top right) before placing your bid. Thebidadoo 100% Guaranteeenables Buyer to return this item for a full refund of the item purchase price if this item was not accurately described and represented. Buyer must directly notify auctionservices@bidadoo.com within 3 days of receiving the item to initiate the return process. All returns must be initiated within 14 days of auction end. The item must not be put to work or altered, and must not be used more than to verify the condition of the equipment. In the event of an authorized return, the buyer is responsible for all shipping, handling and freight charges. Due to the nature of our consignment business, partial refunds are not given. Please see details below. Customer Service Hours: Monday to Friday 8:00am TO 5:00pm (Pacific Time) - auctionservices@bidadoo.com - Please include the eBay Item Number with any inquiry. All emails will be responded to promptly during our customer service business hours. Any Auctions or correspondence that occurs over the weekend or after hours will be handled the following business day. Your satisfaction is our priority -- please contact us immediately to discuss any questions or concerns you may have. bidadoo Buyer Protection Plan bidadoo helps protect buyers through thebidadoo Buyer Protection Plan. This protection is included for every item bidadoo sells. There's no sign-up, opt-in, or registration needed. Coverage is included with your winning bid. bidadoo has represented more than 50,000 successful auctions. With our in-depth professional photos, videos, and detailed descriptions, we make every attempt to accurately presenteveryitem we sell.However, given the nature of the selling used equipment, occasionally something is overlooked or goes wrong. In addition to bidadoos own coverage listed in this auction (see "Returns" below), you are covered by severaleBay Buyer ProtectionPrograms and thebidadoo Buyer Protection Plan.Additionally, your eligible capital asset purchases over $1,000 are covered up to$20,000 for equipment and $50,000 for eBay Motors(that is the coverage amount, the asset sale price may be much higher) by eBays Business Equipment Purchase Protection program. The bidadoo Buyer Protection Plan Covers: Insured - Warehousing and storage for paid items until pickup Bonding - Licensed and Bonded seller (through International Sureties) eBay Coverage - The purchase, repair, or return transportation of this item is protected for up to $20,000 ($50,000 for eBay Motors). That is the coverage amount, the asset sale price may be much higher-as outlined in theeBay Business Equipment Purchase Program Fraud or Loss - Paying for this item and never receiving it. Liens - Protection against receiving stolen property or undisclosed liens that prevents the buyer from acquiring legal ownership of the item. Material Misrepresentation - Paying for and receiving an eligible item that is a different type, make, or model than what was described in the listing, provided the amount of devaluation to the item due to the misrepresentation exceeds $1,500 (see Coverage Limits for further information). Return Shipping - Up to $800 (documented by an invoice from a licensed transport or shipping company) are covered. There shall be no coverage for shipping expenses if the buyer retains possession of the item. Damaged - Receiving this item with undisclosed damage, provided the cost of necessary repairs exceeds $1,500 (see below). For undisclosed damage, certain restrictions apply. The cost of repair must exceed $1,500. The program only covers damages which prevent the equipment from functioning, not defects or damage that are cosmetic or are not critical to operation of the equipment. Cargo Insurance - When shipped via bidadoo approved partners. Up to $500,000 coverage (deductible may apply). Support - Toll-free customer service and logistics support. What is not covered in the Plan: Buyer's remorse. Regular maintenance. Consumables - fluids, batteries, lights, belts, tires, brakes, bulbs, starters, alternators, Freon, and filters. Any incidentals, including but not limited to t ravel costs, fuel, time away, and opportunity costs. Normal wear and tear (including but not limited to rust, dents, scratches, minor leaks, etc.) or cosmetic damage which does not impair the operability of the item. Electrical and functional problems or disconnections (wiring, control boxes, hydraulic leaks) caused in transit or shipping. Any damage or defect that was explained or shown within the auction prior to purchase, or (if the buyer or buyer's agent picked up the item from the seller in person) that could have been noticed upon reasonable inspection prior to shipping. Conditions that can be identified only through the operation of a machine on a job site or under load capacity - For example digging, pulling, and lifting, etc. Operating the machine through the full range of speeds and functions required to evaluate all forward and reverse gears. Use of diagnostic or test equipment to evaluate characteristics such as engine compression. Any repairs or alterations made to the item after the auction end date, which were not authorized by bidadoo or the third party provider of the Business Equipment Purchase Protection program. Additional bidadoo Buyer and Investment Protection Plan: With bidadoo, the quality and protection of your investment is very important to us. If you choose to sell this machine within 12 months of your winning bid, bidadoo will re-inspect the machine and auction it (from one of our locations) for you at a significantly reduced commission rate. bid with confidence knowing that we will find you a buyer if or when you're ready to sell your equipment. Bid with confidence with bidadoo! About Us Shipping & Fees Payment Sales Tax 100% Guarantee Legal BIDADOO MAY OR MAY NOT BE THE OWNER OF THESE GOODS. WHEN NOT THE OWNER, BIDADOO ACTS MERELY A BAILEE ACTING ON BEHALF OF THE SELLER (CONSIGNOR) TO FACILITATE THE SALE OF THE GOODS BY HOLDING OR REPRESENTING THE GOODS UNTIL SUCH TIME AS A SALE IS COMPLETED AND THE GOODS ARE SHIPPED OR PICKED-UP TO THE BUYER. All items are sold AS IS, WHERE IS and WITH ALL FAULTS. BIDADOO AND ANY CONSIGNOR SPECIFICALLY DISCLAIMS ANY IMPLIED WARRANTIES OF TITLE, MERCHANTABILITY, FITNESS FOR A PARTICULAR PURPOSE, AND NON-INFRINGEMENT. Some states do not allow the disclaimer of implied warranties, so the foregoing disclaimer may not apply to you. This warranty gives you specific legal rights and you may also have other legal rights that vary from state to state. bidadoo nor Consignor makes any representation or warranty, express or implied, as to the nature, quality, condition, value or condition of any item, nor that goods conform to any standard in respect to safety, pollution or hazardous material or to any standard or requirement of any applicable authority, law or regulation. Buyer agrees to repair and maintain, at his cost, any goods purchased to a safe operating condition and, without limitation, to a condition which meets any standard or requirement of any applicable authority, law or regulation including those concerning any use to which the goods may be put. Any information supplied by any employee or agent of bidadoo Inc., in any form whatsoever, is intended solely as general guidance for use by bidders and buyers of bidadoo Inc. All descriptions and conditions of equipment in this listing are believed to be correct and have been conscientiously set forth by the owner and/or bidadoo Inc. However, neither the owner nor bidadoo Inc. are responsible for any errors in description or condition. The equipment is available inspection and the descriptions and conditions as set forth on each piece are merely a guide, and in no way a warranty or guarantee, expressed or implied. It is the responsibility of the Buyer to inspect all equipment and to make his own inquiries prior to bidding. Purchases shall become the responsibility of the Buyer and shall be at the risk of the Buyer following the end of this auction. It shall be the responsibility of the Buyer to insure this purchase following the end of this auction. Bidadoo will not be responsible for loss or damage to any property following the end of this auction. The Buyer agrees to obtain all permits and certification as required by law for use, and maintain or modify all purchases as required by law. While personnel at loading sites may assist Buyers, Buyer assumes all responsibility and liability for the loading, securing, transportation, and unloading of purchased goods. Buyer to hold bidadoo harmless for any property damage or injuries related to the loading, securing, transportation, and unloading. Freight and Transportation. The Buyer is responsible for all freight and other costs related to transporting the goods from the posted auction location. These costs include, but are not limited to, certificates and/or permits required to move the goods within or across state, province and/or country borders. Buyers are advised to have all such certificates and permits issued and completed prior to transporting the goods; otherwise Buyer may be subject to cleaning, permit, and/or other fees if the goods are stopped and held at a Port of Entry to a state, province or country. Buyers may arrange transportation of goods through bidadoo or through a third party, but bidadoo will not be liable for any acts or omissions arising from such third party transportation and claims no responsibility for the actions of any transportation provider. Buyers may not transport the goods until full payment (including any applicable sales tax and Handling Fees) have been received by and posted by bidadoo. Buyer, whether acting as principal, agent, officer or director of a company or otherwise, in any capacity whatsoever, and the company he represents, both jointly and severally agree to indemnify and save harmless bidadoo, its affiliates and subsidiaries, and their respective directors, officers, employees, agents, shareholders, partners, successors and its Consignors for any and all actions, cases of action, suits, damages, costs and losses of any nature, arising from the purchase or use of any item. Buyer further agrees that all rights and defenses available to bidadoo hereunder shall extend to the Consignor. Buyer acknowledges that the Auction Site and anywhere the property to be sold is located or displayed is a potentially dangerous place. Heavy equipment is being operated, potentially dangerous materials may be present, electric circuits may be live, and other potential dangers may exist. Each person at the Auction Site (and other areas where the property is located or displayed), at all times shall be there at their own risk. No person shall have any claim against the Auctioneer, their agents, employees or principals for any injuries sustained or death to any person or persons whomsoever nor for damages to or loss or property which may occur from any cause whatsoever. Buyer also acknowledges responsibility for any injury or death to any person or persons whomsoever or property damage caused by Buyer, his agents or his employees. BIDADOO ENTIRE LIABILITY TO YOU OR ANY THIRD PARTIES UNDER ANY CIRCUMSTANCE IS LIMITED TO THE SALES PRICE OF THE RELEVANT GOODS AND $100. Some States do not allow the exclusion or limitation of incidental or consequential damages, so the above limitation or exclusion may not apply to you. California Buyers Note: "When operated in California, any off road diesel vehicle may be subject to the California Air Resources Board In-Use Off-Road Diesel Vehicle Regulation. It therefore could be subject to retrofit or accelerated turnover requirements to reduce emissions of air pollutants." For more information, please visit the California Air Resources Board website at http://www.arb.ca.gov/msprog/ordiesel/ordiesel.htm. "An on-road heavy-duty diesel or alternative-diesel vehicle operated in California may be subject to the California Air Resources Board Regulation to Reduce Particulate Matter and Criteria Pollutant Emissions from In-Use Heavy-Duty Diesel Vehicles. It, therefore, could be subject to exhaust retrofit or accelerated turnover requirements to reduce emissions of air pollutants. For more information, please visit the California Air Resources Board website at http://www.arb.ca.gov/dieseltruck. The Terms and Conditions of this agreement shall be interpreted, construed, and enforced in accordance with the laws of the State of Washington. These Terms and Conditions and the Sellers Agreement constitute the entire agreement between you and bidadoo Auctions with respect to the items for sale and supersedes all prior negotiations or agreements. No modifications or amendment of them will be binding unless in writing signed by bidadoo Auctions. All text and images in this auction are bidadoo, Inc.. All rights reserved. listing design This listing is currently undergoing maintenance, we apologise for any inconvenience caused. New Yakima roof rack with all atachments. KC LIGHTS and NSC LIGHTS, 4.0 FUEL INJECTED with K&N cold air induct. Aftermarket Throttle body, new starter, new 1100 cranking amp battery, NEWBadlands winch, Superwader snorkle , 2.5" lift with 33" Mickey Thompson wheels and tires, New spare tire. Sky Jacker front shocks and Ranchero rear shocks, 800 watt amp with Kicker subwoofer, Cobra CB radio and Kenwood CD player. Hurst shifter tinted windows with hard top. Full doors , fire extinguisher etc.... Too much to list MUST SEE TO APPRECIATE. ASKING $ 14,500 OBO /WAY MORE INVESTED! 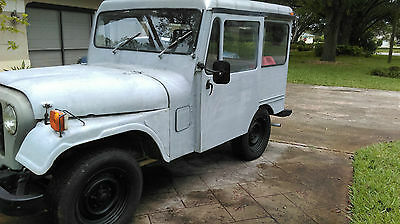 For Sale is a 1976 Jeep DJ5D Postal Jeep, Runs Needs Work, not the original owner, the original owner did all of the restoration work. 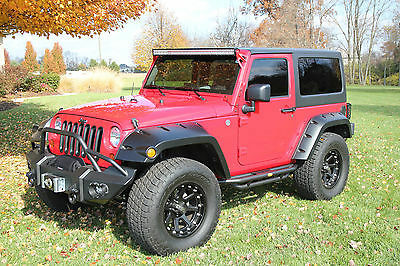 2010 Jeep Wrangler JK Sport Edition in flame red color. This jeep is in excellent condition. Has always been professionally maintained and never off roaded. I have put a number of after market items on the jeep: -XD black wheels with Nitto Grappler Tires (approx. 20K miles useage) -Fab Four rear bumper with swing away tire carrier -Fab Four front bumper with grill guard -T-Max front mounted 9500 rated winch -50” Rigid Industries LED light bar-S&B Cold Air Intake -Interior lined with dyna mat to reduce outside sound -Magnaflow high performance exhaust (pleasant sound, not too loud) -Two inch receiver hitch -Freedom hard top with 3 piece modular design (I do not have the soft top) I’m selling some of the vehicles I own and it’s time to part with this one. It’s in excellent condition and has super low miles. 1952 Jeep Willys Army JeepTMU4 CylinderManual TransmissionRuns GoodSomeone has put a temporary gas tank under the hoodGreat Restoration Project or Play with it like it isSeats need upholsteryHas been converted to 12 volt alternatorFew holes that need to be fixed4 extra army select tires that come with truck We have not driven this truck, we have only started it up and drove around the parking lot. I am not sure of what it might need or what it may not need. This is a great project for a father and son! If you are interested in this truck, please come and check it out for yourself. Please remember this is an old truck but a great project! 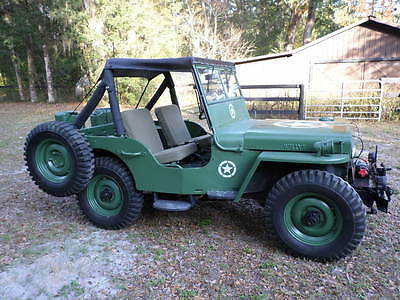 I am listing this jeep for my father who does not use computers. If you have any questions, please call him at 804-733-7573. He is best to reach between 4-7 p.m.
Dmitri (888) 847-9860 10391 Westminster Blvd Westminster Colorado 80020 ? ? ? ? Vehicle Information VIN: 1C4BJWDG1DL645504 Stock: DL645504 Mileage: 61,690 Color: Black Clearcoat Trans: 6-Speed Manual Engine: 3.6L MPG: 16 City / 21 Highway Drivetrain: 4WD ? ? ? ? 1 of 38 ? View Large Images ? ? Options Contact Mercedes-Benz of Westminster 10391 Westminster Blvd Westminster Colorado 80020 View Map Ask for:Dmitri Contact: ?Contact Us Toll Free:(888) 847-9860 Dmitri Direct:(303) 464-6639 Dmitri Text / Cell:(720) 254-8951 Terms Delivery and Handling Charges: To the negotiated price of each vehicle sold there will be added the sum of $599.00 for the cost and additional profit to the seller / Dealer for items such as inspecting, cleaning and adjusting new and used vehicles and preparing documents related to the sale. Placing a Bid: Your bid constitutes a legally binding contract to purchase this vehicle. Please do not bid if you're not seriously interested or financially able to purchase this vehicle. Please read eBay's User AgreementMercedes-Benz of Westminster reserves the right to, Obtain and verify the registered information of all users who bid on this auction. Cancel any and all bids at our discretion, or end the auction early if necessary.Bidders Age: You must be 18 years of age or older to Bid. Special eBay Bid Retraction Rules: Please read eBay's "Retracting a Bid" If you place a bid before the last 12-hour period of the auction: You may retract that bid before that last 12-hour period but only for exceptional circumstances. You will not be allowed to retract that bid during the last 12-hour period of the auction. If you place a bid during the last 12-hour period of the auction: You will be allowed to retract the bid for exceptional circumstances but only if you do so within one hour after placing the bid.Funds & Financing: For help in arranging for a Pre-Approved loan or for any questions please e-mail or phone Dmitri at (888) 847-9860 prior to bidding.Mercedes-Benz of Westminster does not provide financing or leasing options for CA residents due to emissions standards and regulations by the state of California. Cash purchase only for CA residents. Buyers Inspection: Mercedes-Benz of Westminster has done our best to disclose all information known about this vehicle for auction. Mercedes-Benz of Westminster welcomes a buyers inspection. If you plan to have a buyers inspection, please make sure you inspect the vehicle prior to the auction ending. Inspection fees if any are Buyers responsibility. Representations and Warranties made by seller: This vehicle is being sold "as is". Manufacturer's warranties may still apply. Extended warranty may be available, e-mail or phone Dmitri at (888) 847-9860 for details. No representations or warranties are made by seller, nor are any representations or warranties relied upon by bidders in making bids. Taxes and Registration fees: Out of state buyers are responsible for all state, county, city taxes and fees, as well as title service fees in the state that the vehicle will be registered. All taxes and fees must be paid in full in order for vehicle to be titled and registered. Title Information: Vehicles titles may be held by banks or lenders as collateral for loans. In many cases there is a delay in receiving the original instruments up to 21 days from the time we pay a vehicle off. While we usually have all titles in our possession at closing, there are occasions where we may be waiting for them to arrive. If payment is made by cashier's or personal checks we will hold all titles for 10 days or until funds have cleared. Shipping & Delivery: All shipping charges are buyer's responsibility. Mercedes-Benz of Westminster will help with shipping arrangements but will not be responsible in any way for claims arising from shipping damage!Licensed Carriers are generally insured for $3,000,000.00. We assume no responsibility for damages incurred after the vehicle leaves our showroom. All shipping arrangements are provided by Mercedes-Benz of Westminster as a courtesy. We are not affiliated with any carrier. Any claims or other communication regarding shipment of vehicles will be between you and the shipper, not with Mercedes-Benz of Westminster. The amount of time it takes for delivery is dependent on the carrier, but is generally 7-14 days from the date the vehicle is picked up from our facility until it is delivered to your destination. Verify with the shipper for an Estimate Time of Arrival to be sure. Finalizing your Purchase: Mercedes-Benz of Westminster will contact the successful high bidder by e-mail after the auction closes. Successful high bidder MUST communicate with Dmitri at Mercedes-Benz of Westminster by e-mail or phone (888) 847-9860 within 24 hours of the auction ending to make arrangements to complete their transaction. If we cannot confirm your intention to buy or the sale is not completed within 5 days, we reserve the right to relist this vehicle or sell to any other qualified buyer. In order to secure bid on vehicle, Successful bidder (BUYER) must within 24 hours of bid closing send to Seller a Deposit in the amount of 10% by major credit card, cash in person or bank certified funds. Within 72 hours of bid closing, Buyer must send balance of funds by cash in person or bank certified funds to Seller. At time of sending initial deposit, Buyer MUST fax or email copy of their State issued valid Driver License. Furthermore, before said vehicle is released for shipment to Buyer, all other Sale related and title related paperwork must be signed and returned complete to Seller. Copyright © 2017 Auction123 - All rights reserved. - Disclaimer +- Auction123 (a service and listing/software company) and the Seller has done his/her best to disclose the equipment/condition of this vehicle/purchase. However, Auction123 disclaims any warranty as to the accuracy or to the working condition of the vehicle/equipment listed. The purchaser or prospective purchaser should verify with the Seller the accuracy of all the information listed within this ad. Selling a Vehicle? Create Professional Listings Fast and Easy. Click Here! Rich Yang (847) 778-5986 834 N Rush St Chicago Illinois 60611 ? ? ? ? 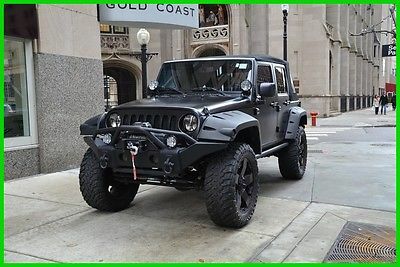 2010 Jeep Wrangler Unlimited Sport Vehicle Information VIN: 1J4BA3H12AL171685 Stock: 71685 Mileage: 21,810 Color: Black Trans: A Engine: V6 3.8L MPG: 15 City / 19 Highway Drivetrain: 4WD Contact Bentley Gold Coast 834 N Rush St Chicago Illinois 60611 View Map Ask for:Rich Yang Contact: ?Contact Us Primary Phone:(847) 778-5986 ? ? ?Credit Application ?Directions to Dealer ?Contact Us Options and Standard Features Options ? 4Wd Type: Part Time ? Abs: 4-Wheel ? Active Head Restraints: Dual Front ? Airbag Deactivation: Occupant Sensing Passenger ? Antenna Type: Mast ? Anti-Theft System: Alarm ? Assist Handle: Front ? Auxiliary Audio Input: Jack ? Axle Ratio: 3.73 ? Braking Assist ? Cargo Tie Downs ? Center Console: Front Console With Storage ? Child Safety Door Locks ? Child Seat Anchors: Latch System ? Compass ? Coolant ? Cupholders: Front ? Door Handle Color: Black ? Driver Seat Manual Adjustments: 4 ? Electronic Brakeforce Distribution ? Engine Oil ? External Temperature Display ? Fender Lip Moldings: Black ? Floor Mat Material: Carpet ? Floor Material: Carpet ? Floor Mats: Front ? Front Air Conditioning ? Front Air Conditioning Zones: Single ? Front Airbags: Dual ? Front Brake Diameter: 11.9 ? Front Brake Type: Ventilated Disc ? Front Brake Width: 1.1 ? Front Bumper Color: Black ? Front Fog Lights ? Front Headrests: 2 ? Front Seat Type: Bucket ? Front Shock Type: Gas ? Front Spring Type: Coil ? Front Stabilizer Bar ? Front Suspension Classification: Solid Axle ? Front Suspension Type: Multi-Link ? Front Wipers: Variable Intermittent ? Gauge: Tachometer ? Grille Color: Body-Color ? In-Dash Cd: Single Disc ? Low Fuel ? Mirror Color: Black ? Passenger Seat Manual Adjustments: 4 ? Power Outlet(s): 12V Front ? Power Steering ? Radio: Am/Fm ? Rear Brake Diameter: 12.4 ? Rear Brake Type: Disc ? Rear Brake Width: 0.47 ? Rear Bumper Color: Black ? Rear Door Type: Side-Hinged ? Rear Headrests: 2 ? Rear Privacy Glass ? Rear Seat Type: 60-40 Split Bench ? Rear Shock Type: Gas ? Rear Spring Type: Coil ? Rear Stabilizer Bar ? Rear Suspension Classification: Solid Live Axle ? Rear Suspension Type: Trailing Arms ? Removable Roof: Soft Top ? Roll Stability Control ? Seatbelt Force Limiters: Driver Only ? Side Mirror Adjustments: Manual ? Skid Plate(S) ? Spare Tire Mount Location: Outside ? Spare Tire Size: Full-Size Matching ? Spare Wheel Type: Steel ? Stability Control ? Steering Wheel: Tilt ? Storage: Door Pockets ? Tire Pressure Monitoring System ? Tire Type: All Terrain ? Total Speakers: 6 ? Tow Hooks ? Traction Control ? Upholstery: Cloth ? Vanity Mirrors: Dual ? Warnings And Reminders: Lamp Failure ? Wheels: Painted Steel Basic Information Stock Number: 71685 VIN Number: 1J4BA3H12AL171685 Style Name: 4X4 Sport Make: Jeep Model: Wrangler Unlimited Model Year: 2010 Vehicle Type: SUV Vehicle Trim: Sport Interior Color: Black Exterior Color: Black Clear Coat Body Type: SUV Engine MPG Automatic City: 15 MPG Automatic Highway: 19 Engine Description: V6 3.8L Fuel Type: Gas Fuel Induction: Sequential MPI Valves Per Cylinder: 2 Aspiration: Normal DriveTrain 4WD Type: Part-Time Driven Wheels: Four-Wheel Locking Hubs: Auto Transfer Case: Manual Transmission: A Wheels Rims: Silver Styled Steel Wheels Spare Rim Type: Steel Drive Train Type: 4WD Suspension Stabilizer Bar: Front And Rear Instrumentation Clock Compass External Temp Low Fuel Level Tachometer Trip Computer Roof and Glass Convertible Roof: Manual Front Wipers: Variable Intermittent Privacy Glass: Light In Car Entertainment Antenna Type: Fixed Audio System: AM/FM Stereo Speakers: 6 Seats Drivers Height: Manual Seating Capacity: 5 Front Seat Type: Bucket Upholstery: Cloth Folding: Fold Forward Seatback Convenience Center Console: Full With Locking Storage Cupholders: Front And Rear Door Pockets: Driver And Passenger Power Outlets: 2 Seatback Storage: 2 Steering Adjustment: Tilt-Adjustable Steering Power: Power Steering Power Mirrors: Manual Comfort Air Conditioning: Manual Trunk Lights: Cargo Area Light Mats: Carpet Front And Rear Shift Knob: Urethane Steering Wheel Trim: Urethane Features Bumpers: Black Door Reinforcement: Side-Impact Door Beam Safety NHTSA Passenger Grade: Excellent NHTSA Driver Grade: Excellent Turning Circle: 41.2 ABS: 4-Wheel Brake Assist: Braking Assist Safety Locks Engine Immobilizer Front Headrests: Manual Adjustable Rear Headrests: 2 Rear Center Seatbelt: 3-Point Belt Safety Stability Control Driver And Passenger Airbag Stability Control: Stability Control With Anti-Roll Door Reinforcement: Side-Impact Door Beam Towing and Hauling Tie Downs: Cargo Tie Downs Doors Rear Door Type: Conventional Side Door Type: Conventional Dimensions Front Head Room: 41.3 Inches Front Hip Room: 55.6 Inches Front Shoulder Room: 55.8 Inches Front Leg Room: 41.0 Inches Rear Head Room: 40.4 Inches Rear Hip Room: 56.7 Inches Rear Leg Room: 37.2 Inches Rear Shoulder Room: 56.8 Inches Luggage Capacity: 31 Cu.Ft. Length: 184.4 Inches Width: 73.9 Inches Height: 70.9 Inches Wheelbase: 116.0 Inches Ground Clearance: 8.7 Inches Max Gross Vehicle Weight: 5,300 Lbs. Curb Weight: 4,242 Lbs. ? Apply Now Secure Credit Application Applying for a vehicle loan online is one of the quickest and easiest application methods. Our secure application is easy to complete, all you need are a few personal and employment details. Terms Placing a Bid: Your bid constitutes a legally binding contract to purchase this vehicle. Please do not bid if you're not seriously interested or financially able to purchase this vehicle. Please read eBay's User AgreementBentley Gold Coast reserves the right to, Obtain and verify the registered information of all users who bid on this auction. Cancel any and all bids at our discretion, or end the auction early if necessary.Bidders Age: You must be 18 years of age or older to Bid. Special eBay Bid Retraction Rules: Please read eBay's "Retracting a Bid" If you place a bid before the last 12-hour period of the auction: You may retract that bid before that last 12-hour period but only for exceptional circumstances. You will not be allowed to retract that bid during the last 12-hour period of the auction. If you place a bid during the last 12-hour period of the auction: You will be allowed to retract the bid for exceptional circumstances but only if you do so within one hour after placing the bid.Funds & Financing: For help in arranging for a Pre-Approved loan or for any questions please e-mail or phone Rich at (847) 778-5986 prior to bidding. Buyers Inspection: Bentley Gold Coast has done our best to disclose all information known about this vehicle for auction. Bentley Gold Coast welcomes a buyers inspection. If you plan to have a buyers inspection, please make sure you inspect the vehicle prior to the auction ending. Inspection fees if any are Buyers responsibility. Representations and Warranties made by seller: This vehicle is being sold "as is". Manufacturer's warranties may still apply. Extended warranty may be available, e-mail or phone Rich at (847) 778-5986 for details. No representations or warranties are made by seller, nor are any representations or warranties relied upon by bidders in making bids. Taxes and Registration fees: Out of state buyers are responsible for all state, county, city taxes and fees, as well as title service fees in the state that the vehicle will be registered. All taxes and fees must be paid in full in order for vehicle to be titled and registered. Title Information: Vehicles titles may be held by banks or lenders as collateral for loans. In many cases there is a delay in receiving the original instruments up to 21 days from the time we pay a vehicle off. While we usually have all titles in our possession at closing, there are occasions where we may be waiting for them to arrive. If payment is made by cashier's or personal checks we will hold all titles for 10 days or until funds have cleared. Shipping & Delivery: All shipping charges are buyer's responsibility. Bentley Gold Coast will help with shipping arrangements but will not be responsible in any way for claims arising from shipping damage!Licensed Carriers are generally insured for $3,000,000.00. We assume no responsibility for damages incurred after the vehicle leaves our showroom. All shipping arrangements are provided by Bentley Gold Coast as a courtesy. We are not affiliated with any carrier. Any claims or other communication regarding shipment of vehicles will be between you and the shipper, not with Bentley Gold Coast. The amount of time it takes for delivery is dependent on the carrier, but is generally 7-14 days from the date the vehicle is picked up from our facility until it is delivered to your destination. Verify with the shipper for an Estimate Time of Arrival to be sure. Finalizing your Purchase: Bentley Gold Coast will contact the successful high bidder by e-mail after the auction closes. Successful high bidder MUST communicate with Rich at Bentley Gold Coast by e-mail or phone (847) 778-5986 within 24 hours of the auction ending to make arrangements to complete their transaction. If we cannot confirm your intention to buy or the sale is not completed within 5 days, we reserve the right to relist this vehicle or sell to any other qualified buyer. In order to secure bid on vehicle, Successful bidder (BUYER) must within 24 hours of bid closing send to Seller a Deposit in the amount of 10% by major credit card, cash in person or bank certified funds. Within 72 hours of bid closing, Buyer must send balance of funds by bank wire transfer, cash in person, bank certified funds to Seller. At time of sending initial deposit, Buyer MUST fax copy of their State issued valid Driver License. Furthermore, before said vehicle is released for shipment to Buyer, all other Sale related and title related paperwork must be signed and returned complete to Seller.Fees There are 3 other fees associated with the transaction. Doc fee $168.43 ,$30.00 out of state drive-away tag and $50 for UPS Overnight (to and from) for the docs. Copyright © 2016 Auction123 - All rights reserved. - Disclaimer +- Auction123 (a service and listing/software company) and the Seller has done his/her best to disclose the equipment/condition of this vehicle/purchase. However, Auction123 disclaims any warranty as to the accuracy or to the working condition of the vehicle/equipment listed. The purchaser or prospective purchaser should verify with the Seller the accuracy of all the information listed within this ad. Selling a Vehicle? Create Professional Listings Fast and Easy. Click Here! 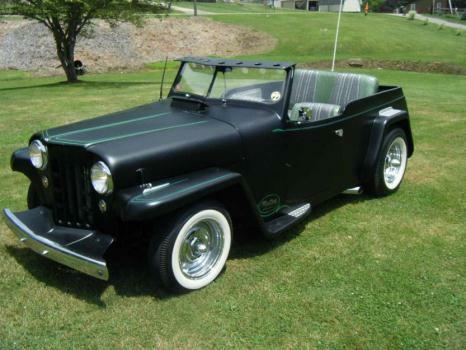 No rust, recent body off restoration, original motor with reinstalled straight 6cylinder.Includes hard and soft top, all glass, sides and doors.